(Weston, Wis., Oct. 4, 2017) – K-tech Kleening, a member company of DKI, North America’s largest disaster restoration contracting organization, announced K-tech Charities, in conjunction with Chatterbox Charities, hosted their 18th annual Fairways Fore Food Golf Outing at Tribute Golf Course on September, 23 2017. 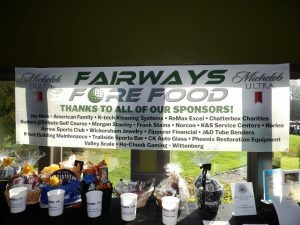 The Fairways Fore Food Golf Outing is K-tech’s main fundraising event to provide funding for holiday food baskets distributed to less fortunate families in the Wausau community and various food banks in Central Wisconsin. Over 10 tons of food is distributed annually. This year, around 90 golfers attended, raising nearly $22,000 through silent auctions, and putting and driving contests. “It is great to see so many familiar faces and new people helping us raise money for the food baskets and local food pantry. We are definitely blessed to have this kind of support for a much needed fundraiser,” said K-tech President Craig Kersemeier. Established in 2006, K-tech Charities of K-tech Kleening Systems has raised over $1,000,000 for financial aid and services, in addition to donating countless employee volunteer hours to local nonprofit organizations. Headquartered in Weston, WI, K-tech has been serving Central and Northern Wisconsin customers since 1975. It still thrives today as a second generation family-owned business with superior commercial and residential cleaning and restoration solution services. Through its K-tech Charities division, conceptualized in 2006, K-tech prides itself in giving back to the community in which it serves. For more information about K-tech Kleening or Charities, visit its website at www.k-techkleening.com or like its K-tech Charities Facebook page.